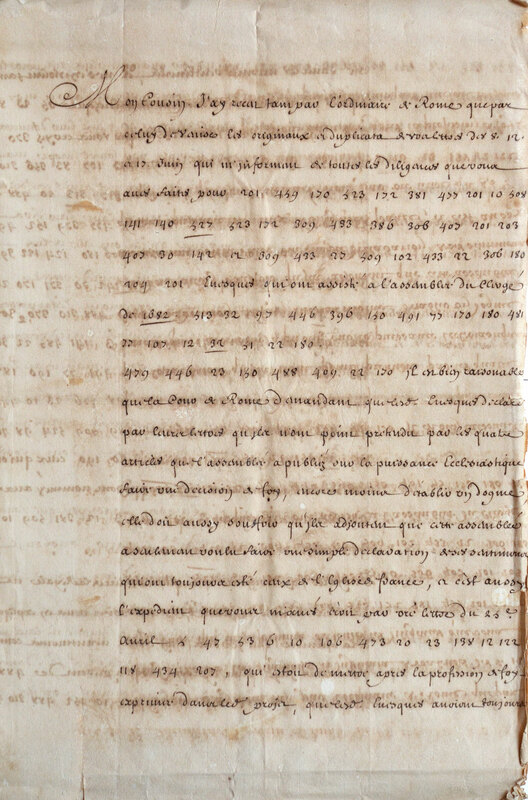 Can you decipher this letter written by Louis XIV? 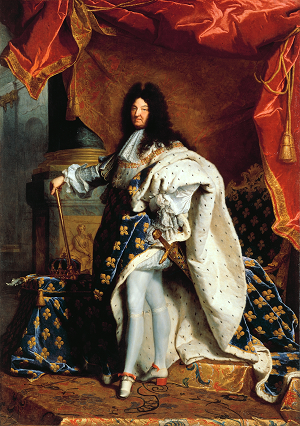 Louis XIV of France, also known as the Sun King, is one of the most important figures in European history. 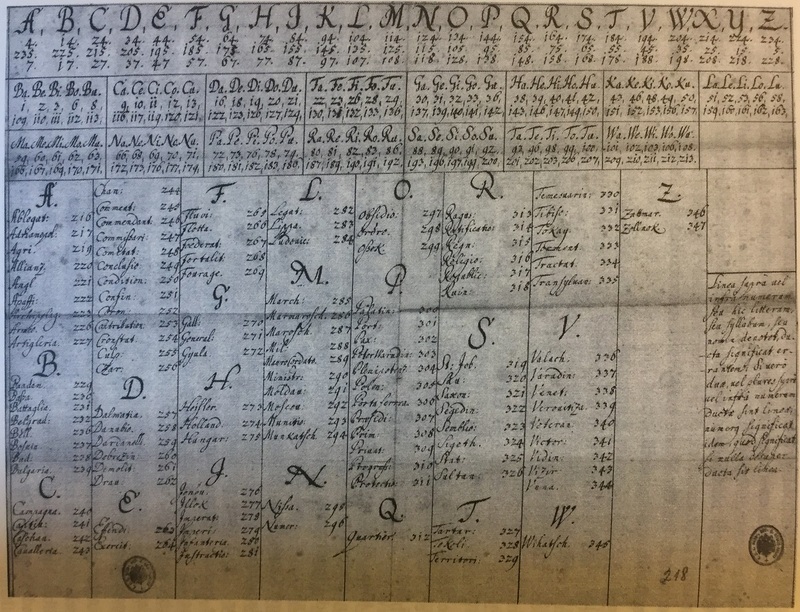 An encrypted letter he wrote in 1693 has never been deciphered. French autograph dealer David Chelli has made me aware of a truly spectacular unsolved cryptogram: an encrypted letter written by French king Louis XIV to the Duke of Chaulnes in 1693. Louis XIV (1638-1715), who is also known as the Sun King, is generally regarded as one of the most important persons in European history. 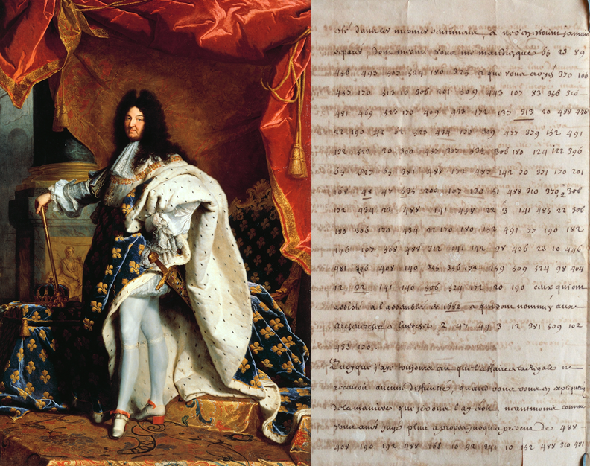 On 10 February 1673, Louis XIV issued a declaration, extending the droit de régale [the regalian right] over all France. The Parliament was pleased, and most bishops yielded without serious protest, only Nicolas Pavillon, of Alet, and François de Caulet, bishop of Pamiers, both Jansenists, resisting. These at first sought redress through their metropolitans, but when the latter took the king’s side they appealed, in 1677, to Pope Innocent XI. 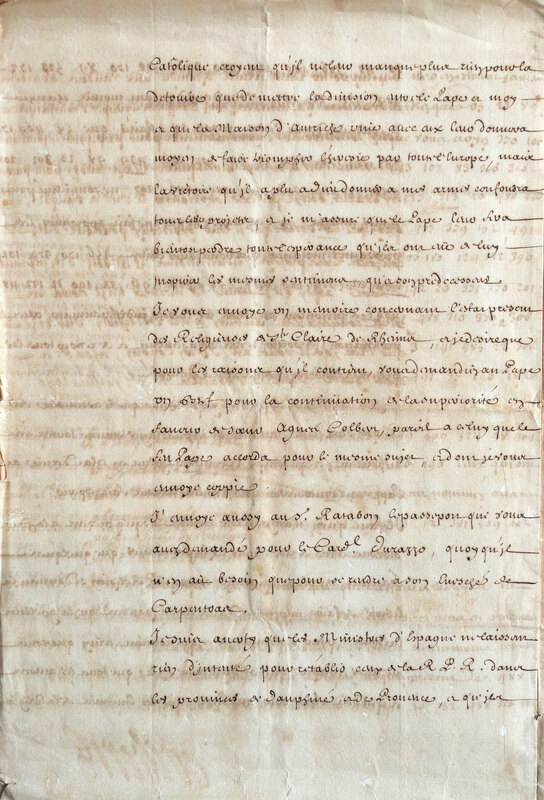 In three successive Briefs the pope urged the king not to extend the right to dioceses that had previously been exempt. The General Assembly of the French clergy, held at Paris in 1681-2 sided with the king, and, despite the protests of Innocent XI, Alexander VIII, and Innocent XII, the right was maintained until the French Revolution. In 1693, Louis XIV sent the Duke of of Chaulnes to pope Innocent XI. The encrypted letter contained instructions for the Duke. As it seems, this letter has not been deciphered to date. 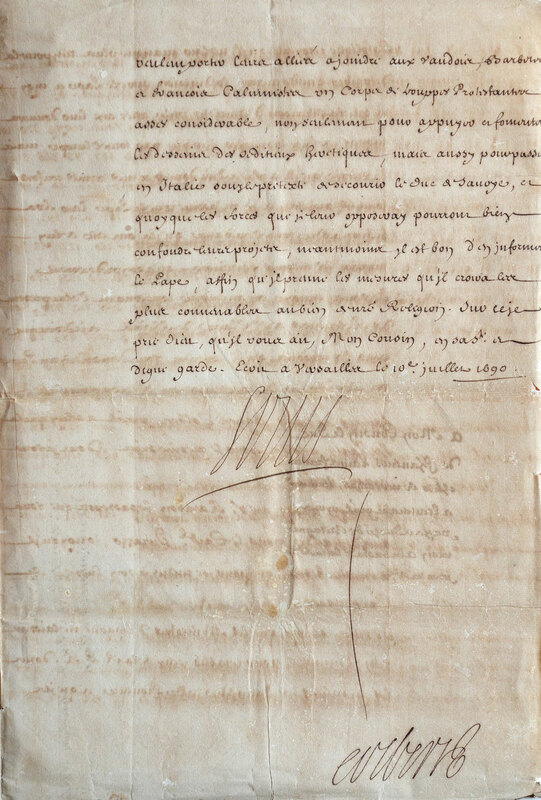 The letter sent by Louis XIV consists of five pages. Only parts of it are encrypted. As mentioned many times on this blog, breaking a nomenclator message is far from easy. Most unsolved nomenclator messages I have introduced over the last five years have not been solved by my readers – though the success rate is usually quite high. As far as I know, there is currently no codebreaking expert in the world who specilizes in breaking nomenclators. I hope, this will change some day. Anyway, it’s worth a try. The first question is, of course, whether the solution of this cryptogram is already known. I’m sure, people have tried to break this message over the last three centuries, and perhaps, somebody was successful. The second question is whether the nomenclator used by Louis XIV can be found. Perhaps, it can be located in a French archive. If the nomenclator is not known, there are still ways to break such a message. Many nomenclators were poorly constructed (for instance, two-digit numbers stood for the letters, while three-digit numbers represented words). Very often, weaknesses of this kind can be exploited. Solving this mystery is a difficult task. Anyway, there is a chance that my readers will be successful. I’m lookig forward to your comments. I couldn’t solve this. 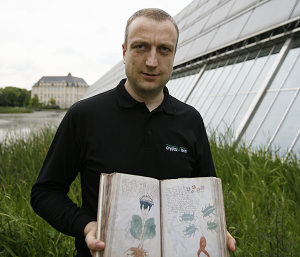 I cataloged ciphers in the reign of Louis XIV on my website. In some of them, indeed, “two-digit numbers stood for the letter”, but I fear in this cipher, symbols for letters are not concentrated among the two-digit numbers. Such a feature is found in Louvois’ codes. The website of the link has a transcription but one paragraph in cipher is omitted. Here is my transcription of the paragraph. By the way, I think the cipher of the image from Birkner’s paper is not French. Its vocabulary seems to be in Italian (e.g., “Artigleria”) and the marginal note seems to be in Latin. Actually, this is a cipher that the Imperial court in Vienna gave to an ambassador to Constantinople (I mentioned this cipher in my artcle.). 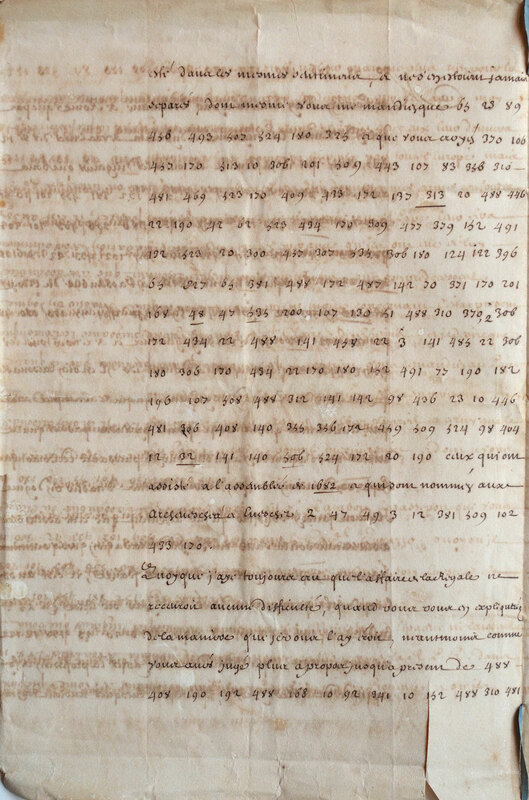 The coded text after “vos lettres des 8, 12 et 17 juin qui m’informent de toutes les diligences que vous avez faites pour” may mean something like “faire entendre raison au nouveau souverain pontife”. I don’t claim this is a plausible reading (it is merely taken from the introduction in the source website as an example). I wonder whether Chaulnes’ previous letters of 8, 12, and 17 June 1690 are extant. I’m having a second thought about my first comment “not concentrated.” I need to consider more. A good source on the ‘assemblee des clerges’ 1690 is this book: https://books.google.de/books?id=–HrXMRB6YAC&pg=PR8&lpg=PR8&dq=bibliotheque+nationale+france+“af.+etr.+”&source=bl&ots=wXSy9Bcj8P&sig=ACfU3U3MpEfMqaW9RaxVEOBKkueGtndvpg&hl=de&sa=X&ved=2ahUKEwi30t-wx5zgAhUiMewKHf4hByIQ6AEwAHoECAMQAQ#v, on page 507, Fn. 6, a letter from June 1690 is mentioned. 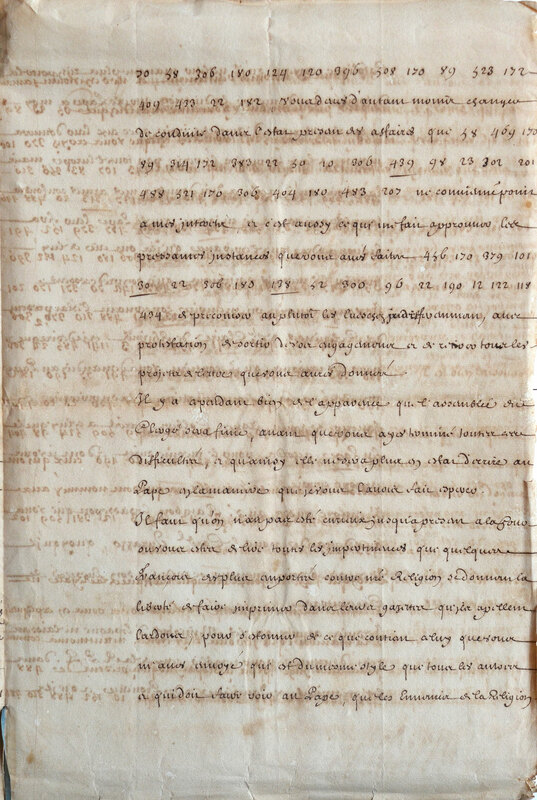 Chaulnes’s letters from June 1690 are hold by this archive: https://www.diplomatie.gouv.fr/fr/archives-diplomatiques/s-orienter-dans-les-fonds-et-collections/fonds-et-collections-d-archives/article/correspondance-politique-origines-1896, see pdf “Rome 01”, 331. There is a digital library of diplomatic affaires: https://bibliotheque-numerique.diplomatie.gouv.fr/MEAE/, unfortunately, I haven’t found out if it contains the aforementioned manuscript. It seems to me that the underscored numbers are plaintext numbers, probably preceding nouns. Maybe there are other sources containing some of these numbers. In my opinion, around 1690 Louvois still reserved Rossignol’s invention of a two-part code (later referred to as “Grand Chiffre”) for his own correspondence. That is why the British code breaker John Wallis said he had “never yet mastered any of his ciphers; and I suspect somewhat of peculiar in his way of cyphering, which I have never yet had the good hap to light upon.” (quoted from Tomokiyo’s website. Also the famous code broken by Bazeries was shared between Louis XIV., Catinat, and – Louvois. I am not aware of a “great cipher” of that time which Louvois was not involved in. War minister Louvois and foreign minister Colbert were bitter rivals at the court. When Colbert countersigned a letter, then Louvois probably did not have a finger in that pie. As I don’t think Colbert had access to a two-part code, this letter is likely to be written in a “normal” code. Just a thought. Thank you for the information. So, there are ample sources for background information for historians. Although I was beginning to doubt my own first comment (#3), I’m now inclined to agree that this is in a “normal” code, like Item (4) in my listing. If so, I wonder whether a key may be found in John Wallis’ papers at Bodleian Libraries. Given the formidable might of cryptologists who have been tackling this and similar codes/ciphers from the period, I can only add two syntactic observations. „[…] auez faites pour 201 […] 201 Eueques qui […] suggests that 201 either be vacant (first use of this code/cipher in the letter), or – more probable – stand for the possessive adjective „nos”, since there is no reason to encode/encipher a definite article which is neutral in meaning. It might be worthwhile to look up the numerical position of possessives in comparable codes/ciphers. – The first enciphered/encoded passage of the second paragraph page 2, „[…] comme vous aués jugé plus apropos jusquà présent de 488 408 190 192 488 [..]” suggest a „ni” for 488, less likely a „ne” because of the short distance between the two. After „ni” either a reflexive pronoun or an infinitive may follow. Since syntax is an excellent tool for nomenclators, a further suggestion. p. 1, end of 2nd paragraph, “et que vous croyez 370 […]”. It is unlikely that 370 constitutes “que”, because there is no reason to encode/encipher “que” at the outset of a phrase. Thus 370 does not begin a subordinate clause, but rather an infinitive phrase. Since infinitives don’t come at the beginning, 370 could either be an adverb (“mieux” etc. ), another possessive adjective (“nos”, “vo[s]tre”) or pronoun (“vous”), or an infinitive following immediately. p. 2, last two lines referred to above. If 488 = “ni” and 408 = infinitive, then 168 = another infinitive, for instance “de ni sou[s]mettre no[s]tre cause ni auancer […]”, or sth to that tune. Whatever the infinitives – if such they be – they would supplement eachother. IF this is a nomenclator in the first place, and not a cipher. I hope we can break the code, even if Louis XIV is probably the most clever of our Kings. Have you shared this with Camille Desenclos. Since you live in Paris, you could have a look at the ‘Archives diplomatiques’ in La Cournueve and see if the manuscripts ‘Correspondance diplomatique’ from 1689/1690, Rome, No. 323, 330 – 334, (see the link in #4, pdf ‘Rome 01’) contain the keytable of the nomenclator used in this letter. Maybe the Cour didn’t burn the keytable and kept it among the correspondence. If this isn’t the case, Chaulnes’s three letters from June 1690 (manuscripts Rome No. 331), which Louis XIV. referred to, might provide cribs. Still… 370~could still represent ‘que’ from sentence syntax viewpoint although not logical from cipher perspective. In the second code piece the letter shows that 513 32 97 446 …. is likely to represent “et / qui sont…”. Let me report my failed attempt. It is based on the assumption that the underlying system is something similar to other contemporary diplomatic codes/ciphers under Louis XIV such as these. One characteristic pattern is 22 306 180 306 170 434 22 170 180. I assumed 170, 180, and 360 are syllables and 22 is a letter. But no plausible word was found matching this pattern or a part thereof. Considering that 170 is the most frequent group, it may be re, de, le, la. Since 170 and 180 may be contiguous elements in the alphabetical sequence, they may be re-ri, de-di, le-li, or la-le. But these are not convincing because both 170 and 180 occur at the end of a word (though there is always a possibility of a foreign name).